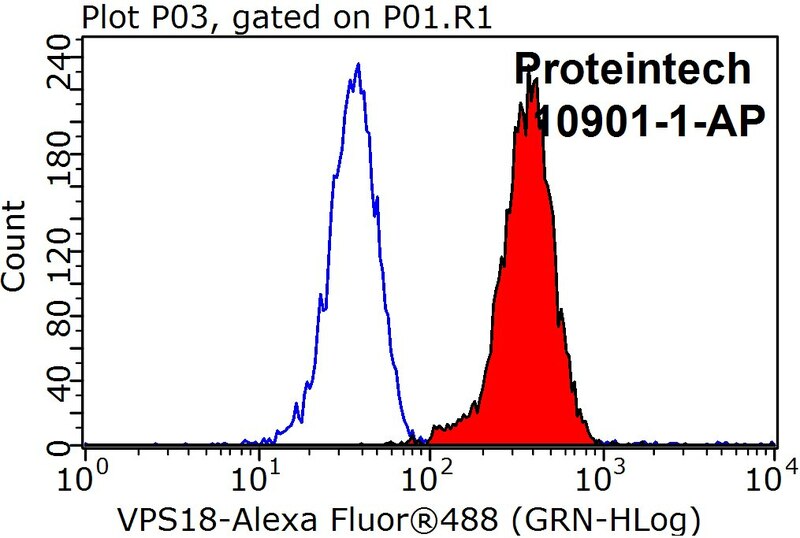 IP Result of anti-VPS18 (IP:10901-1-AP, 4ug; Detection:10901-1-AP 1:300) with HeLa cells lysate 920ug. 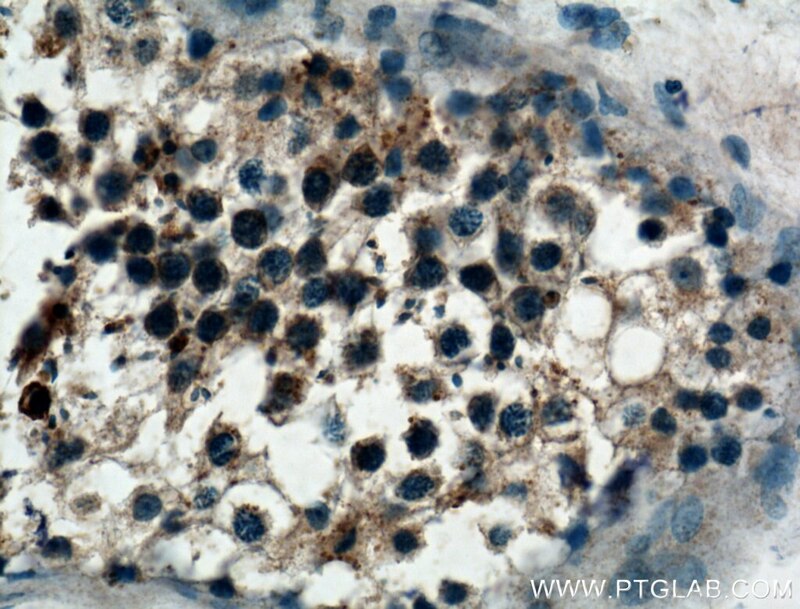 Immunohistochemical analysis of paraffin-embedded human lung cancer tissue slide using 10901-1-AP( VPS18 Antibody) at dilution of 1:200 (under 10x lens). heat mediated antigen retrieved with Tris-EDTA buffer(pH9). 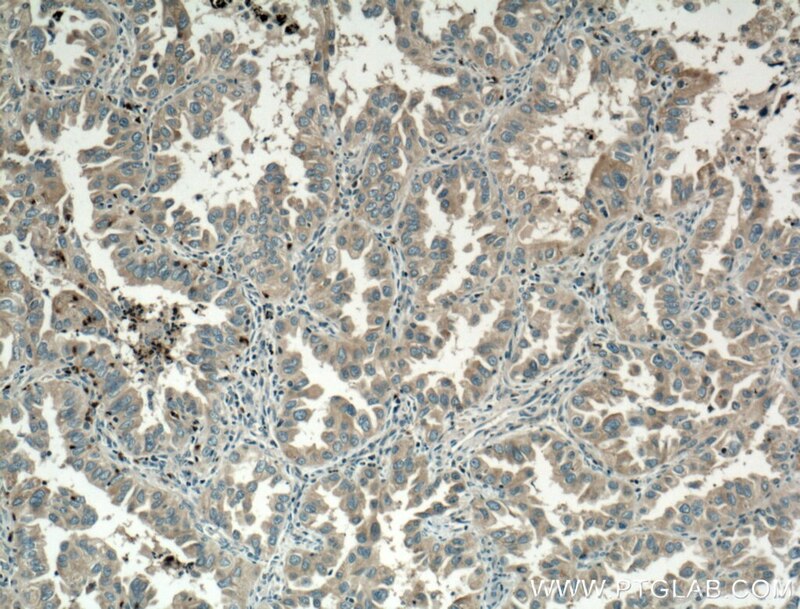 Immunohistochemical analysis of paraffin-embedded human lung cancer tissue slide using 10901-1-AP( VPS18 Antibody) at dilution of 1:200 (under 40x lens). heat mediated antigen retrieved with Tris-EDTA buffer(pH9). 1X10^6 K-562 cells were stained with 0.2ug VPS18 antibody (10901-1-AP, red) and control antibody (blue). Fixed with 90% MeOH blocked with 3% BSA (30 min). Alexa Fluor 488-conjugated AffiniPure Goat Anti-Rabbit IgG(H+L) with dilution 1:1000. Vesicle mediated protein sorting plays an important role in segregation of intracellular molecules into distinct organelles. Vps18 is a central member of Vps-C complex. 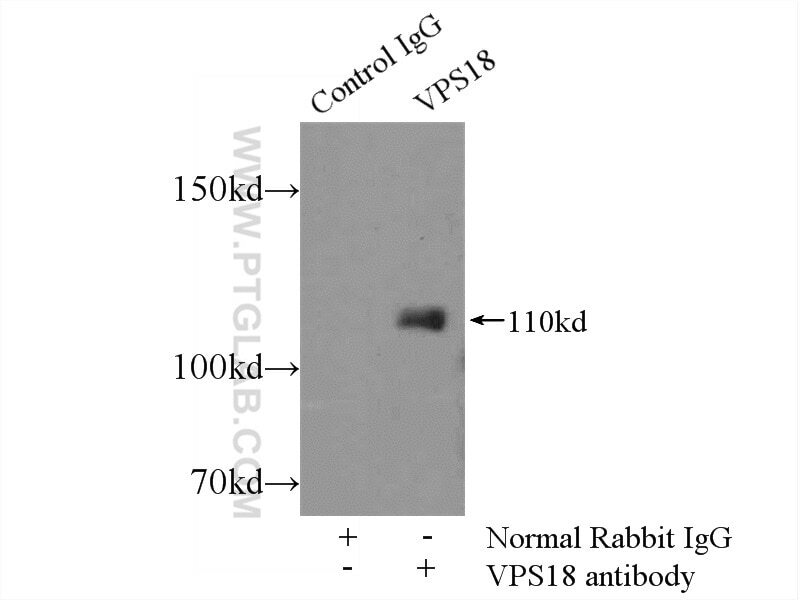 Vps18 may play a role in vesicle-mediated protein trafficking to lysosomal compartments and in membrane docking/fusion reactions of late endosomes/lysosomes. BAG3 and SYNPO (synaptopodin) facilitate phospho-MAPT/Tau degradation via autophagy in neuronal processes. 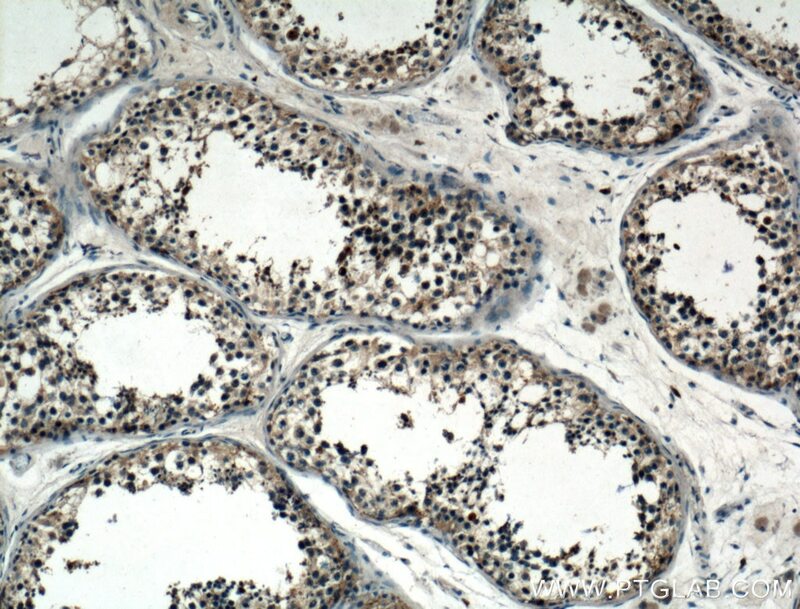 Immunohistochemical analysis of paraffin-embedded human testis tissue slide using 10901-1-AP( VPS18 Antibody) at dilution of 1:200 (under 10x lens). 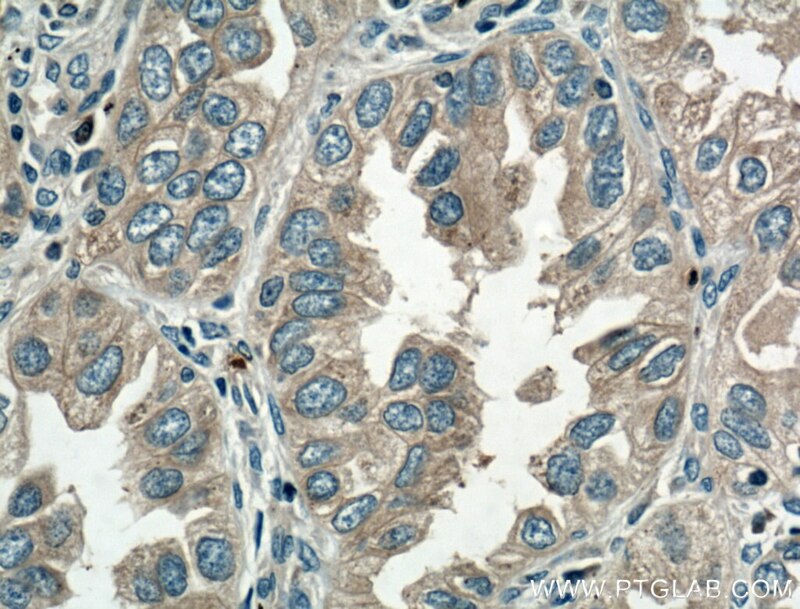 Immunohistochemical analysis of paraffin-embedded human testis tissue slide using 10901-1-AP( VPS18 Antibody) at dilution of 1:200 (under 40x lens).